July 31, 2010 - Sion Power announced that their proprietary lithium sulfur (Li-S) batteries played a critical role in the QinetiQ Zephyr smashing the world record for the longest duration unmanned flight. A result of an intensive joint development effort between Sion Power and QinetiQ, the Zephyr flight exceeded 336 hours (14 days) of continuous flight. Significantly surpassing the previous official record of 30 hours 24 minutes set by Northrop Grumman's RQ-4A Global Hawk in March 2001. The Zephyr?s world record flight was completed on July 23, 2010 at the US Army?s Yuma Proving Grounds in Yuma, Arizona. ?This flight represents a major accomplishment for Sion?s lithium sulfur technology, proving the viability of our high energy, rechargeable battery system.? The Zephyr, a solar/battery powered all electric UAV with a wing span of 70 feet (22.5 m) and a weight of just over 110 lbs. (50 kg), achieved this remarkable record using a combination of solar power during the day and Sion Power?s Li-S batteries at night. After a ground launch, the Zephyr flew to altitudes of up to 70,000 feet, where the UAV encountered external temperatures as low as minus 75?C. The custom built Li-S battery pack was designed and assembled by Sion Power in Tucson, Arizona. The battery utilized Sion?s unique, high specific energy Li-S cells which provide 350 Wh/kg, the highest available for a rechargeable battery. The Li-S battery pack was carefully engineered to minimize total pack weight. Advanced electronic controls maintained the battery condition throughout the flight. ?This flight represents a major accomplishment for Sion?s lithium sulfur technology, proving the viability of our high energy, rechargeable battery system,? said Sion Power?s CEO, Dr. Dennis Mangino. Chris Kelleher, Zephyr?s Chief Designer at QinetiQ, said, ?The performance of the Sion Li-S battery was tremendous. Sion Power?s contribution to Zephyr was a critical factor in achieving this historic and record breaking flight.? An official from the Federation Aeronautique Internationale (FAI), the world air sports federation, monitored the flight and is in the process of confirming a number of new world records. This includes quadrupling the Zephyr?s previous unofficial world record for longest duration unmanned flight, 82 hours, 37 minutes set in 2008. 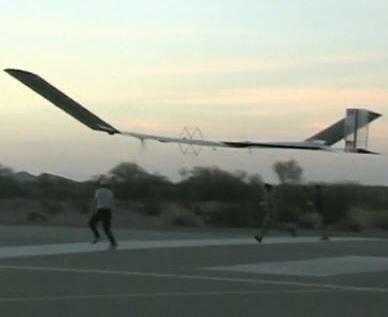 Zephyr will also have flown longer, non-stop and without refueling, than any other airplane ? having significantly passed the Rutan Voyager milestone of 9 days (216 hours) 3 minutes and 44 seconds airborne, set in December 1986. Once launched, Zephyr can remain above a general area for weeks, if not months, at a time delivering vital capability at a fraction of the cost of satellites and significantly more cost effectively than other ?conventionally powered? manned or unmanned aircraft. Zephyr also does not need to return to base at regular intervals for re-fuelling or servicing which helps minimize the logistical supply chain, extending its operational capability and appeal. Its zero emissions also make it exceptionally environmentally friendly. Sion Power Corporation is the global leader in the development of a new generation of high-energy, rechargeable lithium sulfur batteries for UAV, military, portable power and electric vehicle markets. Sion Power has assembled a world class team of 62 employees dedicated to advancing Li-S battery technology. The company has more than 100 U.S. and international patents and is headquartered in Tucson, Arizona.